The owners of this pub wanted a bar surface that would reflect the artisanal quality of their beers. The 25-foot cast-in-place concrete bar at The Surly Goat gets an approving eye by its mascot. Strips of nickel-plated slotted angle iron anchored into the base of the countertop function as expansion joints. To form the curved shape of the countertop, Culloton used fiberglass landscaping material with stiffeners that ran on a slight angle. 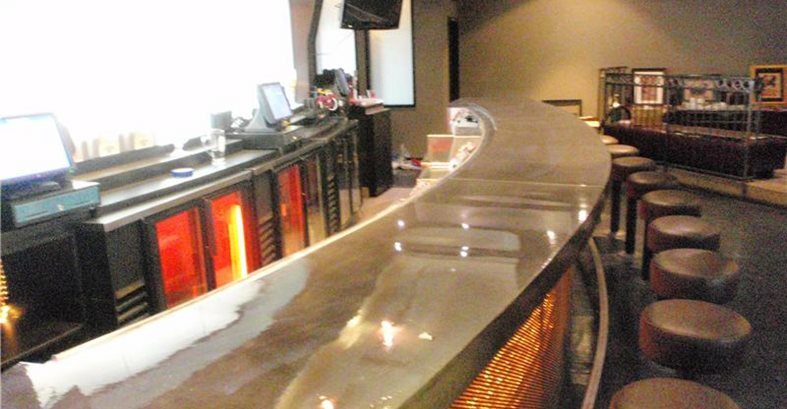 Multiple layers of sealers and protective finishes protect the bar from food and beer stains. The final maintenance finish is a food-safe beeswax. 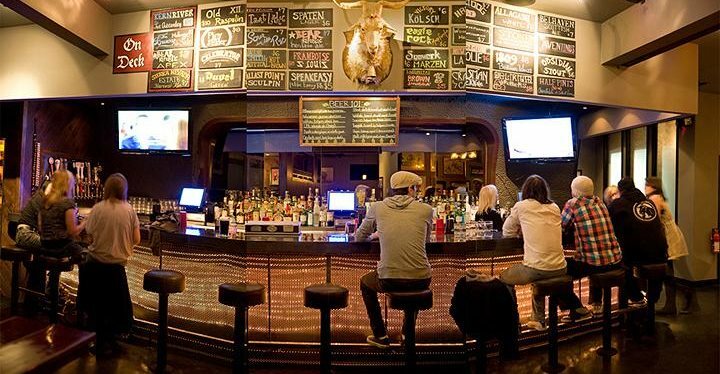 When the owners of The Surly Goat in West Hollywood moved into their current location, they were faced with transforming a space that used to be a glitzy nightclub, painted in garish gold, into a casual neighborhood brew pub with a wall-mounted goat head serving as the bar's eponymous mascot. 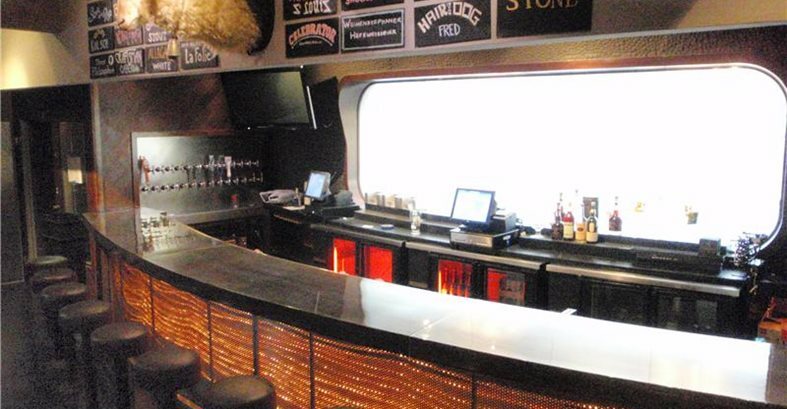 Part of the transformation involved replacing the existing quartzite bartop with something more understated and rustic to go along with the bar's low-key design scheme of gray, charcoal, and burgundy red walls with wood paneling. "Because the bar serves handcrafted American microbrews and artisan Belgian beers, the owners wanted a bar surface to reflect the artisinal quality of the beers, something handcrafted and made locally," says Tim Culloton of Culloton Design, a contractor specializing in poured-in-place and precast concrete countertops, fireplace enclosures, bathtubs and other pieces. "Concrete was a great choice because it is produced locally and we made it with recycled glass silicate, fly ash, brick and concrete, since the owners were also interested in sustainability." 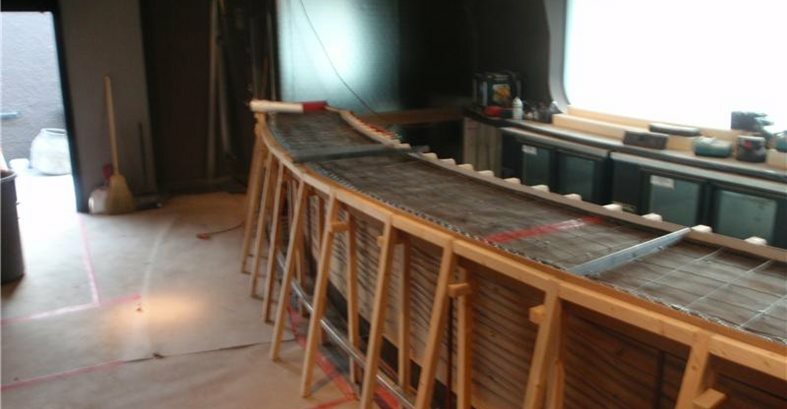 The 25-foot-long concrete bartop was cast in place in three separate sections and reinforced with wire mesh mats and stucco. Nickel plated 1.5-inch slotted angle iron anchored into the base served as expansion joints. To prevent the countertop slab from curling, Culloton ran 1/8-inch threaded rod through channel holes to connect the separate slab pieces. To form the curved shape of the countertop, Culloton used plastic laminate to fabricate the mold face on the interior and reinforced it on the exterior with fiberglass landscaping material with stiffeners that ran on a slight angle. "This material expands to a perfect radius yet remains loose enough to vibrate," he says. To protect the countertop from the inevitable beer and food stains, Culloton applied multiple layers of sealers and protective finishes. He started with a coat of epoxy primer, then sanded the pieces to reduce orange peeling. Next, he applied a wet-look lacquer glaze, sanded the pieces again, and then applied a sacrificial acrylic polish coat. A final coat of food-safe beeswax serves as the maintenance finish. The two seams between the three joined sections were kept tight and level by the slotted angle iron and the reinforcement matrix. After curing, the natural shrinking of the concrete allowed the epoxy sealer to fill any voids. Epoxy primer: Life Deck, from Life Paint Co.
Culloton notes that since the recession, the market for residential decorative concrete in the L.A. area is slow but steady, while the market for commercial applications remains strong. He credits his competitive pricing as one reason for the steady demand for his work. "My price point is $75 a square foot, and since the recession, I have included free returns," he says. "This rate enables me to be competitive with any high-end solid surface. Also, my price includes no hidden costs, so general contractors and project managers know the final cost from the get-go. And we all know that a general contractor that doesn't have to figure out cost is a happy one."